iDSI aims to help policymakers in low and middle income countries in building capacity for active priority-setting, such that they can spend limited health budgets in a more efficient and equitable way, and achieve sustainable universal health coverage (UHC). 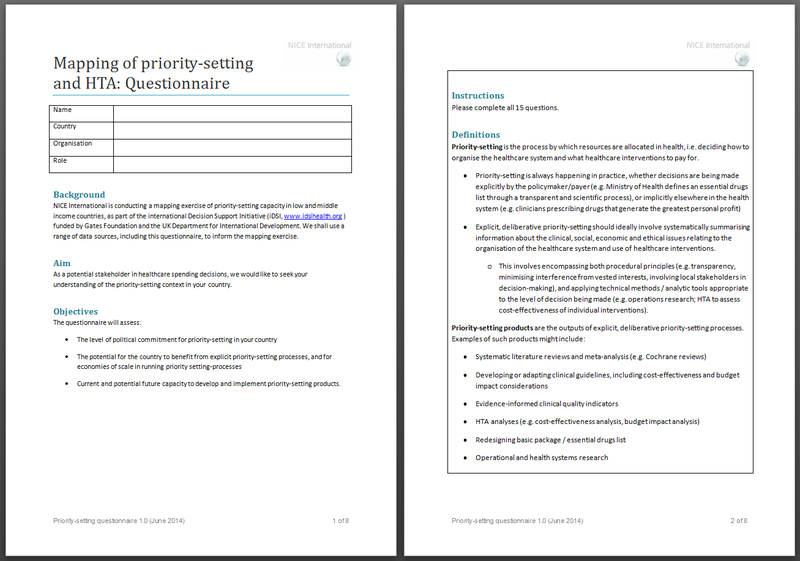 In order to help achieve iDSI this aim, we at NICE International have developed a questionnaire to assess countries’ ‘priority-setting readiness’. We believe this is the first published questionnaire that comprehensively captures priority-setting readiness at a health systems level, beyond the technical dimension of health technology assessment (HTA). We are now making this questionnaire freely available as a global public good, and we hope it will be useful to policymakers, global health funders, academics and international development partners. Our questionnaire builds on an earlier questionnaire developed jointly with HITAP for the purposes of a training workshop in Hanoi, Vietnam (Situation analysis of HTA Introduction at national level, version 2.0, October 2013; for non-commercial use only). Priority-setting is not a merely technocratic exercise. Thus priority-setting readiness comprises more than just technical capacity; it also encapsulates institutional capacity, the political appetite for priority-setting, as well as the potential for the country to benefit from improved priority-setting processes. In May 2014, we saw the adoption of the World Health Assembly Resolution on Health Interventions and Technology Assessment for UHC. The principles behind this Resolution are in line with the objectives of iDSI, and we believe that our questionnaire can be a useful needs assessment tool for countries committed to UHC. We have designed the questionnaire with flexibility in mind. For instance, we piloted this questionnaire as a supervised teaching tool at the recent AfHEA conference, to help delegates understand and think through the opportunities and challenges for priority-setting in their respective countries. And as part of a comprehensive priority-setting mapping exercise of 17 low and middle income countries for iDSI, we have obtained useful data from asking key opinion leaders to self-complete this questionnaire, and using the responses to guide more in-depth discussion. iDSI’s global public good offerings will evolve and improve with time. We are always striving to produce something that will be useful in helping people make decisions, and we would very much appreciate your feedback to make this questionnaire a more useful product. Preferred citation: NICE International (2014) Mapping of priority-setting and HTA: Questionnaire. Version 1.0. NICE: London.